Some species of penguins live in very harsh environments and as a result have to develop perseverance at all costs. 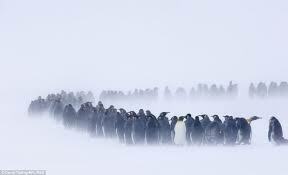 For example, the Emperor Penguin walks 62 miles in the Antarctic winter to get food for its babies. We are so happy that our Nyack Penguins do not live in such a challenging continent, but unfortunately the nor'easter that happened on Friday did have an impact on the Penguin Plunge, making the water hazardous to swim in. But like the Emperor Penguin, and even more importantly, like the children we are honored to support, we won't give up either. We will take our plunge on March 11, (same penguin-time, same penguin-station for classic TV Batman fans) We are sorry for any conflicts or inconveniences that this will cause, but we will do our best to show you why it is worth it to come next week. Elle Fishman and Sebastian Scully are truly appreciative of the kindness of all those who are making this effort. There is still time to pre-register and to even have online pledges to your personal campaign. We all look forward to frosty fun on Sunday March 11, 12-2! Penguins will never give up! Penguins together!